This message comes to you from the ancient Silk Road area, known for being the lucrative “crossroads” of conquering armies, cultures and peoples. Diverging and diverting, settling and vanishing. All the while bringing with them Intellect, art and music. Music created by instruments to make sounds to be heard by the human ear to tell tales and to please the listener. This truly is an place in space and time where you could think about creating a whole new Genre of Blues, the makings of American Blues that originated not only from the Delta to Chicago but from Americans that have been to Afghanistan and Iraq. Blue seems to be my basic color on the palate of my mind’s eye each night under threat of rocket attacks, IED’s, the image of the anguish on people’s faces, their needs, their desperation. 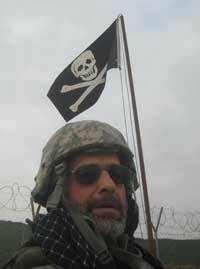 Each time I go on missions “outside the wire” in harm’s way to do my job, I take with me my “lucky charms”. Guitar picks from PNW musicians, prayers from friends, dirt from Muddy Waters home in Clarksdale MS and of course my bullet proof, Vashon Island Company, LOLLAR GUITARS logo t-shirt! Strong medicine for a superstitious, experienced war wary and weary volunteer. You are currently browsing the archives for the Washington Blues Society category.